Louise Swartzwalder | Bellville Star Village council is moving ahead with plans to make changes in local sewer and water fees. Council members also heard details about a proposed expansion to the cemetery. 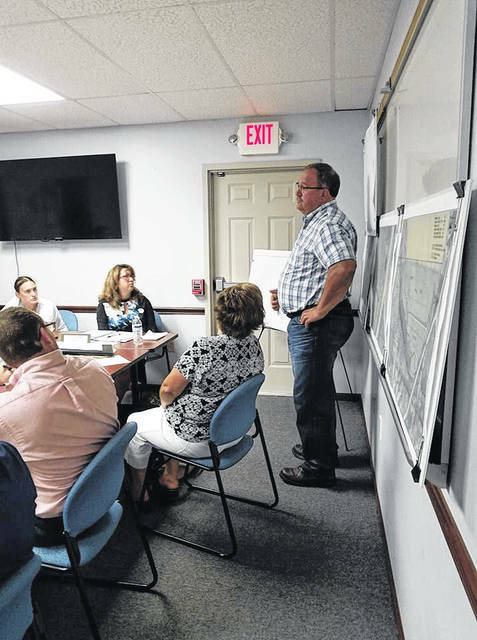 BELLVILLE — Village council is moving ahead with plans to make changes in local sewer and water fees. The public utilities committee of council is recommending a 3 percent increase in sewer and water fees, that the late charge be increased from 10 to 20 percent, and that the shut off and reconnect fee remain at $50. Council member Stephen Edwards and public utilities committee chairman told council at last week’s meeting that the committee recommends changes be made. Council agreed to proceed and the matter has been turned over to Sarah Mussman, village solicitor. An ordinance change will have to be drafted. Edwards told council the committee recommends hiring Scott Belcastro, of Trebel LLC, as an aggregation consultant, to analyze utility fees. Belcastro has appeared before council to explain his firm’s services several times. Council approved going out for bids of an expansion of cemetery space just outside the village. The engineering firm of K. E. McCartney and Associates Inc. has prepared plans so the village can go out for bid. Josh Epperson, chairman of the cemetery committee, said land will be elevated by one to two feet by the drive area so concerns about flood plain position should be handled. He said there aren’t “going to be any floating caskets or anything.” The site is located just off State Route 97 west across from the children’s cemetery. It is 14.64 acres. It is estimated this will provide 2,868 graves, said Weirich. Council approved a resolution granting a $5,000 bonus to fiscal officer Brigette Gatton. Village administrator Larry Weirich, in his report, told council the village has changed its insurance company. A shift has been made to Rhinehart Walter and Danner, a company in Mansfield. Council agreed an ad can be placed concerning a zoning changed needed for land which must go from B-3 to a R-2 designation if the area is annexed. No date has been set for placement of an ad. The land is owned by Jim Gorman and totals 40.55 acres. It is also off State Route 97 west. https://www.thebellvillestar.com/wp-content/uploads/sites/39/2018/08/web1_Bellville-council.jpgLouise Swartzwalder | Bellville Star Village council is moving ahead with plans to make changes in local sewer and water fees. Council members also heard details about a proposed expansion to the cemetery.